Scott Arfield celebrates opening the scoring at Anfield. Burnley remain unbeaten away from home in the Premier League following this afternoons 1-1 draw at Anfield. Here's how the action unfolded. Yellow cards for Jack Cork and Emre Can. Nick Pope pushes the ball behind for a corner from a Can shot, didn't need to touch it. 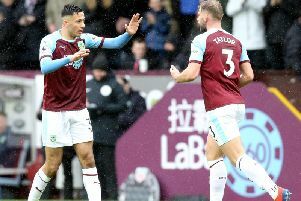 Burnley double substitution: Ashley Westwood and Sam Vokes replace Steven Defour and Chris Wood. Solanke hits the bar! From Alexander-Arnold's cross Solanke hits the bar from six yards out. Nick Pope saves well from Alexander-Arnold, big save from the man making his first Premier League start. Solanke effort from distance sails harmlessly wide. Ben Mee header from a Robbie Brady corner is cleared off the line and out for another corner which again is met by the head of Ben Mee, this time Mignolet saves and Liverpool clear, two big chances for Ben Mee. Liverpool double substitution: Oxlade-Chamberlain and Solanke replace Firminho and Coutinho. Coutinho effort from the edge of the box ends up in the top tier. Jack Cork releases Robbie Brady whose effort is collected at the second time of asking by Mignolet. What a challenge from James Tarkowski to deny Coutinho, brilliant. James Milner on the volley after cheeky little clip from Sturridge, Tarkowski does well to block. Anthony Gardner sends a shot well wide of Nick Pope's goal. Burnley sub: Ashley Barnes replaces Johann Berg Gudmundsson. Jack Cork charges down a Coutinho effort from the edge of the area for a Liverpool corner which eventually ends at the feet of Sturridge whose shot is well saved by Pope. James Milner drags a shot wide. Yellow card for Nick Pope for time wasting. Emre Can fires an effort at goal which Nick Pope spills, Tarkowski is there to clean it up. Coutinho lifts an effort well over the bar from the edge of the area. Daniel Sturridge runs at the Burnley defence before attempting to lob Nick Pope, the effort sails over the bar. Burnley restart the game, no changes for either side. It's all square at Anfield as Roger East blows his whistle for half time. Daniel Sturridge low shot is saved by Nick Pope. Three minutes of added time. Ben Mee can only divert his header wide from a Gudmundsson free kick. Curling Mohamed Salah effort is straight at Nick Pope. Liverpool fans on their feet, but Daniel Sturridge can only hit the side netting. Tame Mohamed Salah shot is comfortable for Nick Pope. Daniel Sturridge can't get onto the end of a teasing James Milner cross. GOAL! Burnley's lead doesn't last long, Mohamed Salah slots the ball past Nick Pope after collecting Can's long ball. GOAL! Scott Arfield latches on to a Chris Wood knockdown to put the Clarets into the lead, fantastic finish from the midfielder. Mohamed Salah heads over the bar from Daniel Sturridge's cross, Liverpool applying the pressure now. Stephen Ward charges down a Daniel Sturridge shot. Salah goes down in the box under a challenge from Tarkowski but referee Rodger East waves away the appeals,. Liverpool get us underway, Burnley are in their white away kit. Both sides emerge from the tunnel, kick off is moments away. Liverpool boss Jurgen Klopp is keeping a keen eye on Burnley's pre-match warm up.